Happy Friday! It's later in the evening here and I am just getting a moment to upload this post. We are definitely living a 'Summer Schedule' these days! 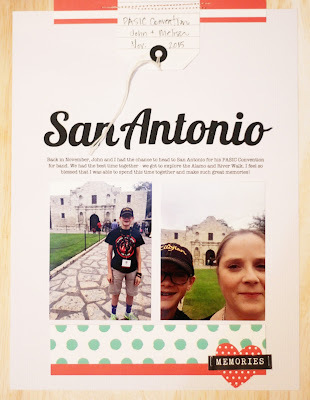 Todays layout documents a trip to San Antonio that I took with my son and the entire Percussion section of his band. There was a PASIC Convention and I got to serve as the female Chaperone. Don't cringe - it was actually a great trip with a great group of kids! The photos for this page were not so great - they were taken with my iPhone, and in the case of the one with John + I together, it was a selfie at arms length away. Thats ok, though. These photos are the ones I have, so they are the ones I will use. I kept the design for this page simple and easy - basically planning everything around the width of my photos. I used papers from the Felicity Jane Next Stop and Note to Self Collections. The polka dot definitely lends itself to a girl page more than a masculine page, but when used with woodgrain I think it balances it out a bit more. The red and black papers work as a great anchor for everything. The heart has been diecut with a simple heart punch (from the same papers). The 'memories' label is from the Next Stop Collection. I used my Tim Holtz Tiny Attacher to secure it. I wanted to point out the tag at the top. I actually used a Silhouette file and cut it from a piece of the Note To Self collection. After it was cut out, I quickly ran it through my sewing machine. Quick and easy. Todays Tip is to keep things easy. Don't overthink the design and don't overthink the papers. Keep things simple - one or two patterns and then add in bolder colors to anchor your design. Have a great Friday night, friends. We are settling in for a movie night and hamburgers! Love your page Melissa. 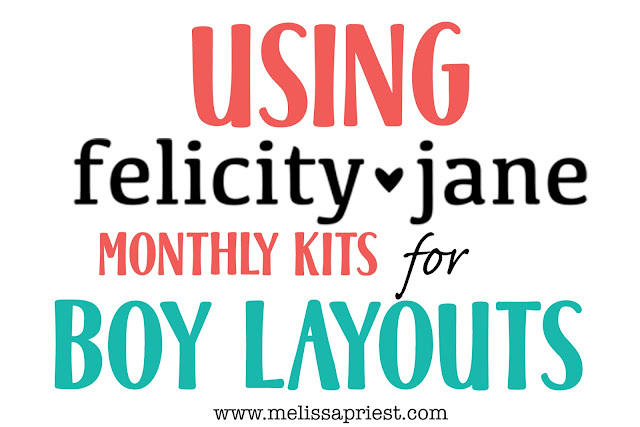 And I will admit to not using much of my Felicity Jane papers because I think they will need to used for very girl pages. Thanks for giving me a second thought about that. I am really enjoying these, since I have 3 grandsons I will be watching. Love the tips. I think there's a charm to these kind of photos and you've shown them off beautifully with this layout.